Shoot first, no questions later. 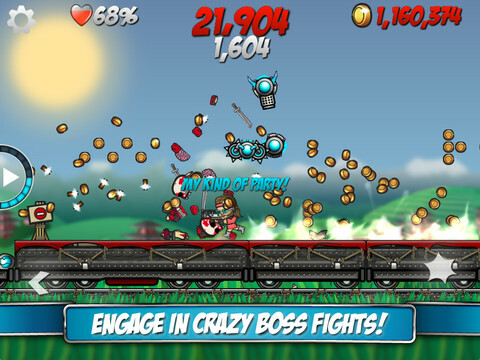 Werewolves, zombies and other enemies stand between you and glory in Chillingo's free-to-play 2D shooter, Storm the Train, an endless platformer that tasks you with blasting baddies and collecting gold coins. With a steady stream of creatures pouring from the right side of the screen, it'll take more than gunfire to see you through this high-speed adventure. That said, gain that all-important advantage with our Storm the Train cheats and tips guide. It should go without saying that taking a tumble off the train is bad for one's health, but you'd be surprised how often we succumb to random brain farts, accidentally sending one of the game's three heroes to his or her death, watching helplessly as their bodies explode into fleshy chunks. With this in mind, watch your step amid the chaos. As we mentioned, Storm the Train comes with three characters, and each one has unique stats. Mason, for instance, is by far the slowest, but makes up for his plodding pace with the most health. Graham, on the other hand, is the more balanced of the three, while Carrera is the quickest. Ultimately, you need to figure out which stat (health or speed) is more important. Of course, you're free to upgrade each character's health in the Shop. Tip: You can switch characters during play for a price. Just tap the icon on the left, and cycle through the available power-ups. Just because a zombie falls over doesn't mean it's dead for good. Walk past the body, and more often than not, the creature will get right back up and resume the chase. It's a good idea to wait for it to make the first move, or jump over the creep to advance. Upon reaching the lead car, the game will ask you to jump to the next train. Do exactly that, instead of the opposite, which involves mindlessly plummeting onto the track below. It's worth repeating: don't fall off the train. Dislike the virtual button placement? Move them around to best fit your thumbs. During play, press the icon on the top left corner of the screen, then tap the controller icon. From there, feel free to adjust the directional arrows, shoot and jump buttons. Yes, each character can double jump by tapping the button twice. It's the best way to avoid large groups of enemies and/or survive giant leaps of faith. Stars are one form of virtual currency, by far the toughest to obtain. You stand to gain a modest amount, though, from completing missions, like destroying a certain number of enemies, or rescuing a hostage. Note: You can spend virtual Coins to buy more Stars. While playing, check out the icon on the left. Kill a certain number of enemies to fill that sucker up, whereupon which you'll gain access to a power-up. Might be a different character (complete with 100 percent health), a Turret Drone or even the Mayhem Suit. Always handy in a fight. Note: No time to wait? Tap that same icon and purchase unlocked power-ups with coins. Don't let all those gold coins burn a hole in your virtual pocket. Head to the Shop and spend the cash to unlock new weapons, like the Assault Rifle, Shotgun and Rocket Launcher. Keep in mind that some weapons require a pre-requisite number of stars. In other words, unless you have 32 stars, you won't be able to purchase the 800 coin Raygun. Ah yes, the easiest way to victory.